- As a work of art (design, for instance) See notice. - As a programming method, see for instance [Meyer]. Obsolescence . See our Perenniality notice. Octree. 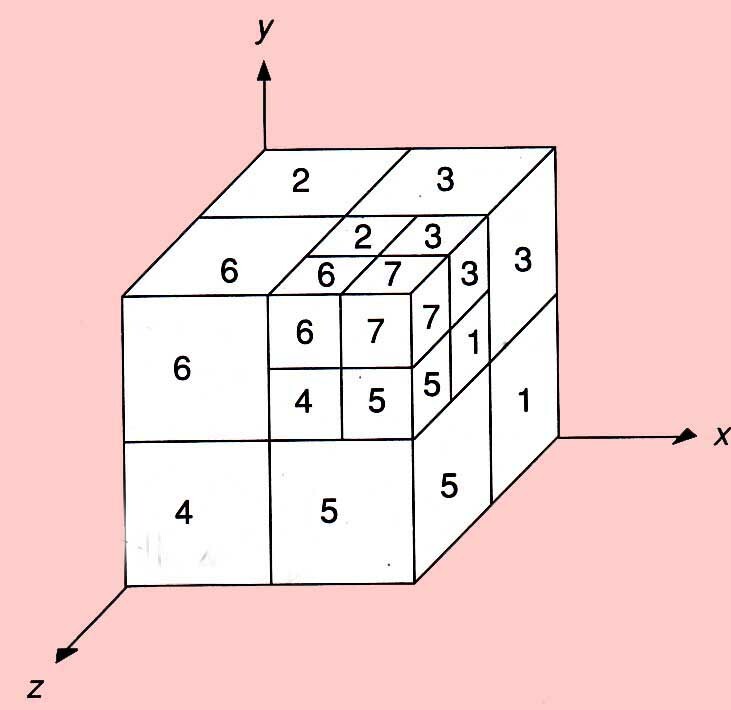 Method for enumeration of the parts of a 3D space [Foley]. - Still not very digital. But you can find "perfume organs" (29,95 euros on 1/24/2011 at Science shopping . - An odorama "is an experimental media about olfactive organ of the spectator. It remains a rather marginal technology."(Wikipedia). - Béatrice Boisserie (in Le Monde Magazine, May 28, 2011) indicates an Odorama, first odor interactive cinema, launched at Cité des Sciences et de l'Industrie de La Villette in 1985. ODRL. Open digital rights language. Initiative proposed to the consortium ISO/IEC MPEG and aiming to offer an exchange standard in the DRM (Digital Rights Management) worlds. AH No 53 . - "Off-line media" is a name for records. 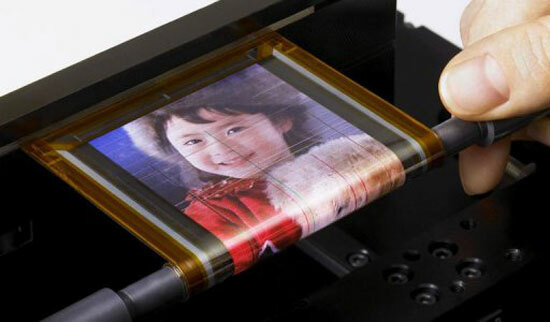 Oleds, the end of "rigid computers" (here, Sony, in a page by Fubiz). Oled. Organic light emitting diode. Wikipedia. See LED. Ontogenic (modeling). [Ebert], for textures, "based on visible morphologic features". - In the classical/scholastical way, ontology was the science of being as a being (ens inquantum est ens). In modern science, ontology works at linguistic level, and describes (or standardizes) the relations between words. - The term is used in image retrieval. See the works by Eero Hyvönen or of the Seco (Semantic computing research group). 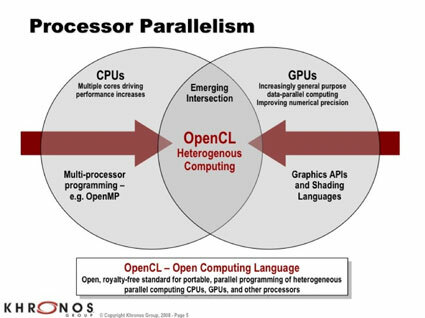 Open CL is important for parallel programming, notably of the GPU, graphical processor units. Open CL. A standard for GPU programming. Not for amateurs. Wikipedia. OpenCV. An open standard for vision functions programming. Processing language may access to it. - Real-Time Computer Vision with OpenCV. by Kari Pulli, Anatoly Bakseehv, Kirill Kornyakov and Victor Eruhimov. Communications of the ACM, June 2012. "Mobile computer-vision technology will soon become as ubiquitous as touch interface". - Learning OpenCV. Computer vision with the OpenCV library by Bradsky Gary & Kaehler Adrian O’Reilly 2008. Open GL. A standard for graphic programming. [Ebert]. 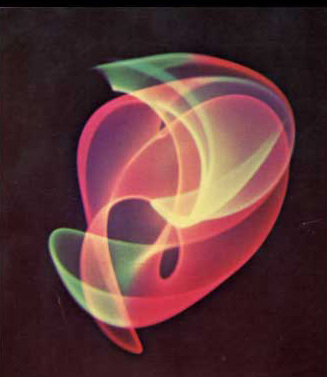 - Edmond Couchot is the one only to have used the expression "Optical art". See terminology. Oratory (art) . See rhetoric. Organ . The most ancient and the most ambitious of digital (acoustic) instruments, initated with the mouth organ (Wikipedia.). < Organ Augmented Reality: Audio-Graphical Augmentation of a Classical Instrument by Christian Jacquemin, (LIMSI-CNRS, University of Paris Sud 11, France), Rami Ajaj (LIMSI-CNRS, France), Sylvain Le Beux (LIMSI-CNRS, France), Christophe d’Alessandro (LIMSI-CNRS, France), Markus Noisternig (IRCAM, France), Brian F.G. Katz (LIMSI-CNRS, France) and Bertrand Planes (Artist, . More in French. - Le Paris des Orgues, association. Website. ortan at Saint Eustache (Paris). - "The ordinary instant, is the instant equidistant of the others. We shall define cinema as a system which represents movement relating it to the ordinary instant" [Deleuze], p. 15 (our translation). - From the ready-made of Duchamp to the soup cans of Warhol... do art with an ordinary object... not so easy, explains Judith Housez (Marcel Duchamp, Grasset 2006). - Note about the word "some" in H. Cohen. Originality. An essential feature of art. Synonym: unpublished. - It can be measured (for instance by Sacem, in France). - It is somehow an aesthetic criterion. But voluntary transgressions can be artistic also. See [Leech]. - Quantitative study about orthography: L'orthographe française (Traité théorique et pratique avec des travaux d'application et leurs corrigés), by Nina Catach. Nathan 1980. - For French orthography: Orthonet by the Conseil international de la langue française. Oscillon. A form or electronic art, not digital. by Ben Laposky. See the thesis of Nick Lambert. Opening. A morphological operation on an image, in order, for instance, to suppress some sets not thick enough, of filtering contours. See [Bres], p. 123.